With three unique product lines formulated to our Biologically Appropriate standards, ACANA is guaranteed to meet the diverse nutritional needs of today’s dogs and cats. Made in our own award-winning kitchens, ACANA‘s authentic foods keep your pet healthy, happy and strong. Read our ingredients and we think you’ll agree. ACANA Heritage foods are our original Biologically Appropriate recipes that celebrate our 25-year tradition of featuring Fresh Regional Ingredients grown close to home by farmers, ranchers and fishermen we know and trust. That means ACANA Heritage foods are brimming with free-run poultry and nest-laid eggs from local farms, freshwater fish from regional waters and red meat from Appalachian ranches — all delivered in fresh WholePrey ratios to nourish completely. Prepared in our Kentucky DogStar Kitchens from America’s best and freshest ingredients, these unique and Biologically Appropriate foods are a delicious way to keep your dog healthy, happy, and strong. Check out the Heritage line! Regionally inspired and Biologically Appropriate ACANA Regionals feature a diversity of fresh ingredients from Kentucky’s fertile farmlands, meadows and Appalachian ranches that’s unmatched by any other dog food. Made in our Kentucky DogStar kitchens from America’s best and freshest ingredients, our ACANA Regionals are protein-rich and loaded with a richly nourishing 70% of ranch-raised meats, free-run poultry and eggs, wild-caught fish and sun-ripened vegetables, fruits and botanicals. Check out the Regionals line! Limited ingredients shouldn’t mean less meat. That’s why we make six nourishing single-protein foods, perfect for healthy dogs with food sensitivities. ACANA’s Biologically Appropriate limited ingredient foods, perfect for healthy dogs with food sensitivities, are chock-full of meat, including grass-fed lamb, Muscovy duck and Yorkshire pork, then infused with freeze-dried liver for exceptional taste. Check out the Singles line! Perfect for all dogs – including diet sensitive ones, ACANA Singles Dog Treats are Limited Ingredient, Biologically Appropriate and totally delicious. 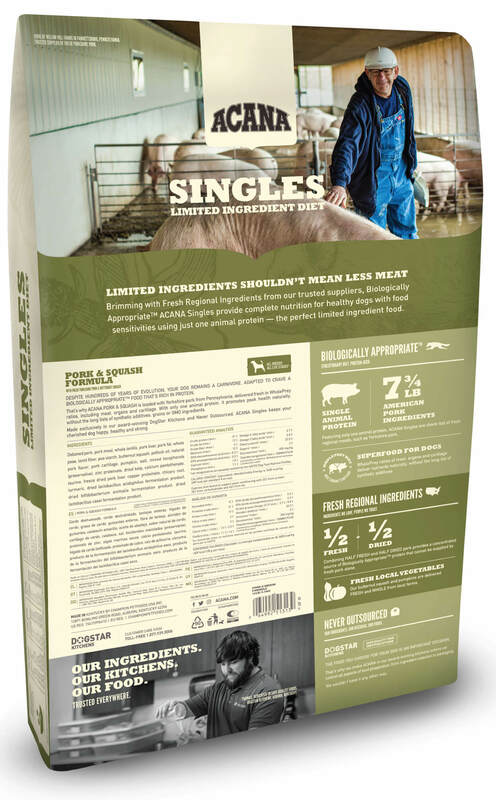 Featuring a single animal protein, these delicious and nourishing treats are formula-matched to ACANA Singles Dry Foods, and include the very same fresh local meats, poultry and fish. Made without cooking and completely free of synthetic preservatives, ACANA treats are gently freeze-dried to lock in all the natural goodness and taste of our fresh regional ingredients. Check out the Singles Treats line! The biologically appropriate concept is simple: mirror the quantity, freshness, and variety of meats that nature evolved dogs and cats to eat. ACANA’s richly nourishing meat inclusions mirror your pet’s evolutionary diet, excluding rice, potato and tapioca, vegetable proteins, synthetic additives and anything else Mother Nature didn’t intend your dog or cat to eat.